It's like so many of these "development" places which have not evolved, but just started up. The lease or whatever has to be paid, and the developer's profit gained. There's too much commercial pressure, and the modern business practices are palpable. That said ,the beers were OK, but the food very unexceptional as you'd expect. Some of the staff were clearly doing their level best to offer good service and make a success of the place, but maybe others weren't. Then again, would you for what they were probably paid? After our visit today I can honestly say that I shall never return to this place again. I ordered my food at the bar from a girl who did not tell me that there was a wait on food, my wife overheard another member of staff telling their customer there was a 30 min wait on food, thinking that we could cope with an extra half hour (presumably not including cooking time) we decided we could cope. After 50 mins we asked a waiter if he could find out where our food was, he was very polite and told us that we should have been told there was an hour wait on food orders, as this was not the case we asked to speak to the manager and he quickly returned with her. The manager was not only unhelpful but she actually implied that it was somehow our fault, she then said that all the food was cooked but there wasn't enough staff on to get it all out quick enough and that buy talking to us more people would have to wait longer for there food, not once did she apologise. a full hour after we ordered our waiter (still smiling despite all the complaints from neighbouring tables) brought our food over only to find that the girl who took the order in the first place had missed one of our 4 meals off, I was quite angry by this point yet this young man assured me that he could get the chef to cook my wife's meal in a few short minutes free of charge, true enough in just under 7 minutes he returned with her meal. I took my 2 year old to the malt house after a trip around the sea life centre. we had a mid afternoon bar meal of burger and fish finger sandwich and I enjoyed a pint of ale. The staff are friendly, helped me choose the beer by letting me have some tasters, and made my daughter feel at ease. 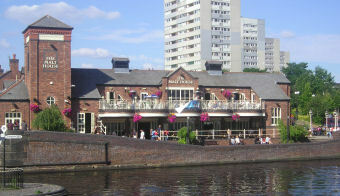 The food was served on time, tasted good and the atmosphere was nice - it's good to be able to look out on the canal network. One last thing about this place and probably the most important - I left an expensive camera there, and the staff kept it for me until I could get it back home. Good place, friendly and honest staff. Recommended. This is a massive pub on two floors. 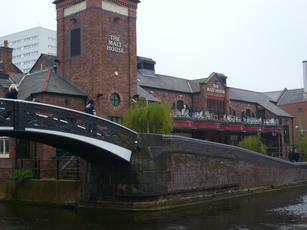 It�s got loads of canalside seating and also an upstairs outside terrace with good views over the canal. It quite nicely done inside in a featureless barn sort of way and there are loads of dining tables everywhere. It has a dance floor area upstairs but I don�t know if this is used, it certainly wasn�t being yesterday at about 5 of course. There�s a huge TV screen over the bar and there�s also a quiz machine, they also have live bands on at times. There are an incredibly optimistic 10 handpumps on the bar, some look as if they�ve never been used. There were only two beers on and these were the really boring Bombardier and Directors, come on guys show a bit of imagination. I had a Bombardier which was pretty good really and promptly won �8 on the quiz machine, so all in all I was pretty happy. It was busy when we went here, the staff didn't seem to be able to cope with serving such a large number of people, had a pint of bombardier which was not on form so went on the guinness which was ok.I ordered some food and was told it would be about an hours wait, one and half hours later still no food, i went to see what the delay was only to find other irrate diners doing the same, finally got our food, the chicken was burnt underneath and luke warm, we were so hungry we just ate our food and left and promised never to return.